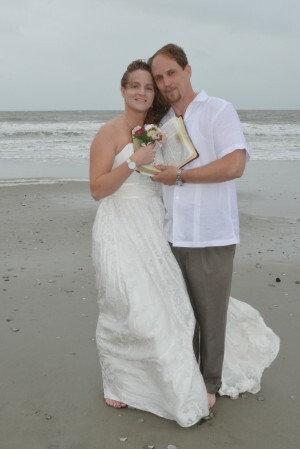 Miranda Rae Davis and Jason Eugene Evans both of Candler, North Carolina were united in marriage on May 4, 2013 at Wedding Chapel by the Sea in Myrtle Beach, South Carolina. Dr. Terrence Grainger officiated. The bride is the daughter of Marvin Ray Davis of Candler, North Carolina and Margaret Ann Coleman of Asheville, North Carolina. She is the granddaughter of Rev. Homer and Betty Moore of Asheville, North Carolina. The bride’s attendant was her daughter, Mckinna Laurel Tice. The groom is the son of Tom and Cherette Boza of Leicester, North Carolina and Larry Eugene Evans of Candler, North Carolina. The bride holds an Associates in Applied Science in Business Administration from Asheville-Buncombe Technical Community College. She is employed as an Account Coordinator at Guthy-Renker Fulfillment Services, LLC. The groom holds an Associates in Applied Science in Networking Technology from Asheville-Buncombe Technical Community College. He is employed as a PC Support Technician at Guthy-Renker Fulfillment Services, LLC. After a honeymoon in Virginia Beach, Virginia, the couple will reside in Candler, North Carolina.